In arithmetic and algebra, the cube of a number n is its third power: the result of the number multiplied by itself twice. n3 = n x n x n. It is also the number multiplied by its square: n3 = n × n2. To calculate cube a number, just multiply it 3 times. Example: What is the cube of 2? What is the cube of 11? … a special value that when cubed gives the original number. … 5, because when 5 is cubed to get 125. To find the cube root of a number, you want to find some number that when multiplied by itself twice gives you the original number. 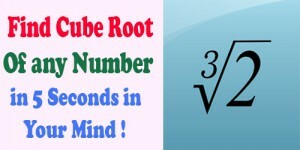 In other words, to find the cube root of 8, you want to find the number that when multiplied by itself twice gives you 8. The cube root of 8, then, is 2, because 2 × 2 × 2 = 8. When multiplying add the powers. When dividing subtract the powers. When taking the power of a number already raised to a power, multiply the powers. For example this is how to find the square of 23. Notice that the answer has an index of 6, which comes from multiplying the powers at the beginning (3 x 2). Here is another example. Step 1: See the Cubes of 0 to 9. But to memorize the cube up to 9 will be best if you want to check your answer in mind. Step 2: Determine the Cube Root . Ignore the last three digits of the number called out by the Questioner and choose the memorized cube which is just lower (or equal) to the remaining number. The cube root of this is the first digit of your answer. Now consider the last digit of the number called out by the Questioner. This will indicate the last digit of your answer. For example, if the last digit of the number called out is 3, then the last digit of the cube root is 7 (see the last digit values in the table above). Step 3: Before you try this out on your friends, you should practice until you can calculate the cube root instantly and without error. If you can’t do this, then practice some more! 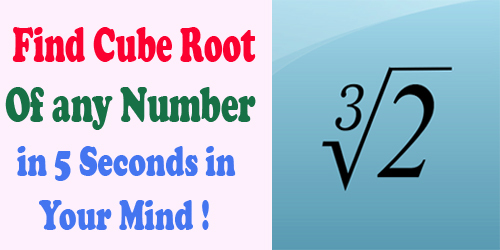 If You want to understand better and clear your doubts, watch the video below on How to Find Cube Root of any Number within Seconds.